October is a beautiful month, isn’t it? The leaves are turning, the pumpkins are ripe, the nights are cool and the days are perfect. This October is going to be even more beautiful, because this October, I’m going to give you 31 days of decorating inspiration, how-tos, and mood boards. I’m going to share some really beautiful spaces, including the front porch from Kris’s house and others. You’ll see some “how-tos” on painting, repurposing, and reinventing pieces to fit in with your décor. And I’ll share some behind-the-scenes info about my part time business, The HomeShed. I clicked on Facebook to like your page, but got an error message. May want to check your link. Thank you SO much! I think it's fixed now! Oh Yeah! Can't wait to see what you have to offer. Love some good inspiration. 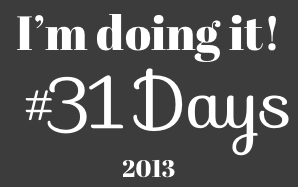 Hopefully that is what others will get from my big 31 days...haha! Love October, junk, and antiquing. YAY!! !